Michael Jackson One Discount Tickets 2019 20% Off! Save up to $34 OFF Michael Jackson One by Cirque du Soleil 2019 tickets! Save up to $58 OFF Michael Jackson One by Cirque du Soleil tickets! On for a limited time at the Mandalay Bay hotel and casino in Las Vegas Nevada, you can enjoy a one-of-a-kind Cirque du Soleil experience. Cirque du Soleil brings the life and legacy of Michael Jackson to the stage in a spectacular acrobatic circus performance. Featuring some of the late artist’s best hits as well as some of the world’s finest acrobatics, viewers will be transported through every era of Michael Jackson’s music. 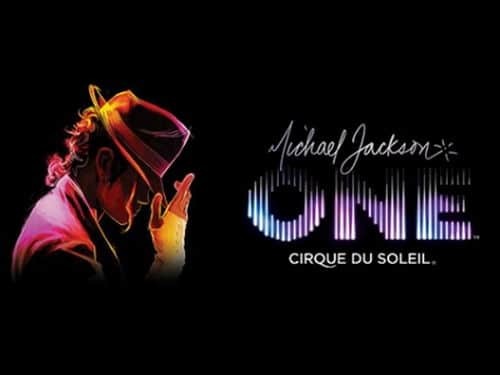 Michael Jackson one by Cirque du Soleil is playing Thursday to Monday at Mandalay Bay in a 7 PM and 9:30 PM show. With prices starting at just $65+tax you can get treated to a world-class Cirque du Soleil performance featuring some of the finest music from the King of Pop. The production for Cirque du Soleil was created by both the Cirque du Soleil company as well as Jamie King. Jamie King is the same producer that brought the Michael Jackson Immortal world tour. He is a producer that has worked extensively with Michael Jackson throughout his career starting first as a dancer on the dangerous world tour in 1992. In collaboration with the Jackson estate and Cirque du Soleil, Jamie King arranged the music, assisted with choreography and the spectacle that is Michael Jackson One. In the show, viewers will follow four different misfits that set out to explore the world of Michael Jackson’s personality and music. By the end of the show each one of these misfits represents a piece of Michael Jackson including his playfulness, his love, his athleticism and his courage. Since the show premiered on May 23, 2013 it has captivated thousands of audiences and featured original performances of Michael Jackson’s hits “Bad”, “2000 Watts”, “Thriller”, “Jam”, “Smile” and more. If you’re planning on a trip to Vegas and you love Michael Jackson or Cirque du Soleil this is a must-see show! For the best ticket prices for Michael Jackson One, you can follow the link above this description and enjoy a 25% discount on Michael Jackson One with tickets starting at only $75 including tax!